I looked up to the television for a split second to see him calling for the ball. This was to be Marvin Bagley’s first post-up move against future Hall of Famer Kevin Durant. You could tell the Duke product was anxious. He was the second overall pick in last year’s draft just like Durant went second overall in 2007. For now, the similarities end there. 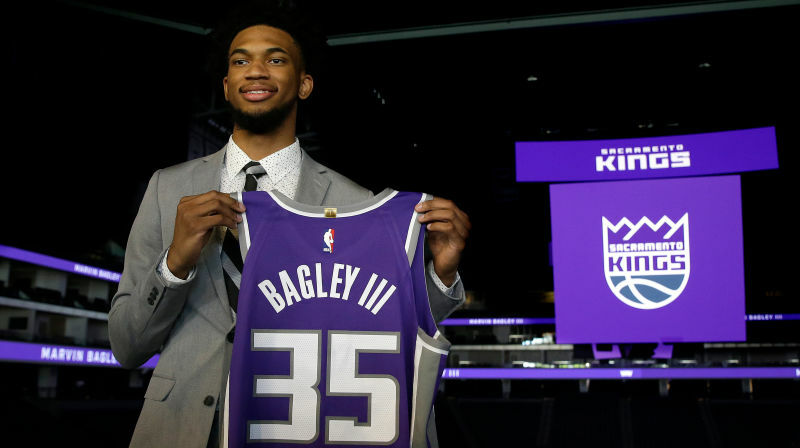 Bagley, the newest and now most high-profile Sacramento King, got fed the ball on the left block, a reasonable distance from the basket but Bagley had Durant right where he wanted him… or so he thought. In the annals of be careful what you wish for, this lay-up gone bad turned out to be what will be the first of many hard, welcome-to-the-league moments for the young Mr. Bagley. After a couple of timid post moves and pump fakes that Durant didn’t fall for, Bagley dribbled left towards the basket. He even had a step on Durant who, while not known for his defensive skills on the blocks, can make up for it with his quickness and length. Durant was able to body Bagley enough defensively to not allow a clean look at the basket. Bagley overcommitted and was forced to go under the backboard. He was still able to attempt a low percentage lay-up. That lay-up turned out to be ill-advised as Durant’s help came from the opposite side. That’s what championship teams do. They have each other’s backs. From the other side of the lane, Warriors second year center Damian Jones got a nice clean look at Bagley’s shot, blocking it off the backboard and securing the rebound. Jones took two dribbles and immediately started the fast break, getting the ball to Durant who took one dribble then passed cross court to Klay Thompson who, without dribbling, set up from about thirty-five feet and did what he does best. Three dribbles, three points in about three seconds. Welcome to the NBA, rook. These are your Golden State Warriors. Until now, you’ve only seen them on TV. Friday night, they polished off your Kings by 28 in a game that wasn’t even that close. Already in post-season form in a pre-season game, the newly bearded and scorchingly hot Thompson finished with 30 points, shooting six-for-ten from distance. Apparently, he didn’t take the summer off. The young Marvin Bagley will be a superstar in this league but rest assured he’ll be thinking about that play for a while. If he wants to grow as a player, he better. The Warriors lost their pre-season opener to Minnesota but if Friday night’s matchup against the Sacramento Kings was any indication, it should surprise no one that the Warriors already look poised to add another title to their already impressive trophy case. That’s something to which Marvin Bagley can only hope to aspire. It’s the NBA and his time will come. He’ll just have to pay his dues first. He started that on Friday night. This entry was posted in Featured, Hardwood and tagged Marvin Bagley III by Chris Humpherys. Bookmark the permalink. Bleed… I know the Kings are bad and I know the Warriors lost their pre-season opener but it was just wrong what the Warriors did to Sactown on Friday night. I wonder if this team will be motivated enough in the regular season to win 70 games. I know it’s only preseason, but damn it felt good to beat the Warriors twice in a row.